I have been very fortunate – I’ve taken the Wild Africa Trek twice! I loved it so much the first time, with my husband and son, that I talked additional family members into signing up for it this summer. Seven of us ventured out! What is Wild Africa Trek? For those that are not familiar with this tour offered by Walt Disney World, it is a “backstage” type of tour in Animal Kingdom. There are age and weight restrictions (yes, they will weigh you; no, they won’t announce it!) and you must be ambulatory to take part. If you have been on Kilimanjaro Safari, you may have seen people hiking, crossing rope bridges, riding in special smaller trucks on the savannah. You might have seen me! We opted for the earliest time available since we were doing this in the middle of Summer. So we signed up for the 8:00 am adventure. We get to enter Animal Kingdom prior to rope drop (unless it happens to be an Extra Magic morning). A guide came to the entrance and checked us in. About 15 minutes before the tour, we walked back to the Kilimanjaro Safari area. There is a separate entrance for the Wild Africa Trek. Once there, several cast members helped us to gear up for the adventure! Wear comfortable walking shoes and be prepared to leave your personal items in a secure locker. You may wear glasses/sunglasses – they will provide you with a strap for them. You may also bring a camera, as long as you can secure it by neck or wrist strap. I brought mine along and took the pictures seen here. Disney doesn’t want anything falling into the animal areas. We were fitted with vests, harnesses, name tags, and were given a water bottle (that we get to keep) that gets secured to the vest. They are very safety conscious and they will check our vests and harnesses several times during the hike. We also wore earpieces so we could hear the cast members easily. Two guides take us on the adventure and they also bring a camera to capture lots of pictures of everyone on the tour as well as animals along the way. The first part of the tour is hiking through the woods. Our first stop is the hippopotamus habitat. 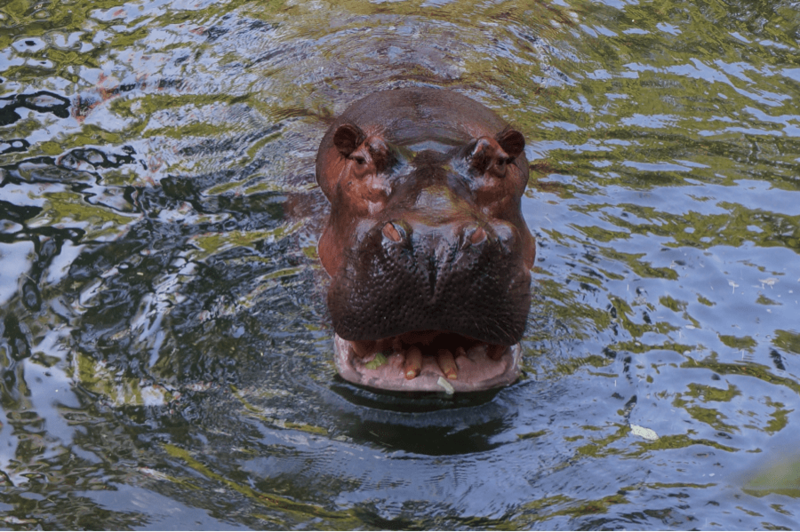 A cast member who is an animal specialist drops in to tell us all about hippos, feed them in front of us. We went through a gate and were connected to a safety bar. Walk to the edge and look down. HIPPOS! The tether to the safety bar will keep us from falling in. The cast member will also answer any questions about hippos. The next part of the tour was my favorite part! 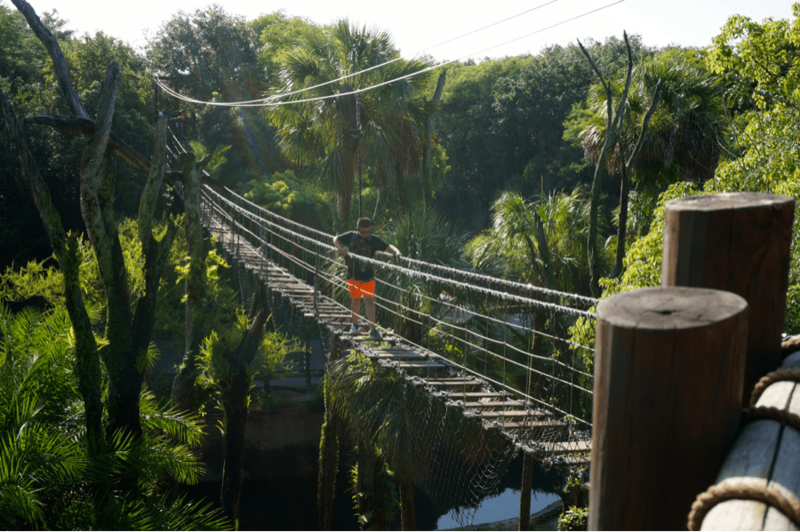 We got to walk across two rope bridges. Again, a cast member tethered us to a track above the bridges for safety and spaced people out so there was never more than two people on a bridge at one time. Sometimes there was only one person on the bridge, and I think that’s where the weighing in at the beginning of the tour comes in. The bridges are actually very safe, but they do move a lot and if you have a fear of heights, this may not be for you. 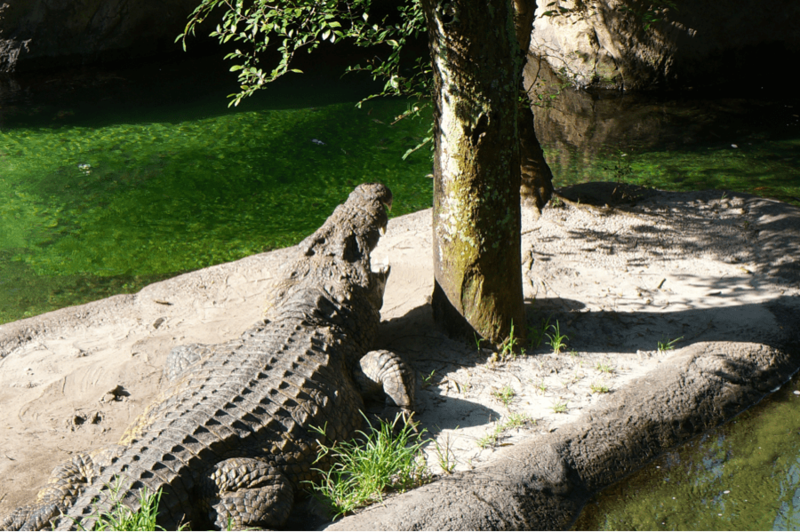 Once we crossed the bridges, we got to learn all about crocodiles, again tethered like we were to see the hippos. There is also water at this stop so we can refill our water bottles. It was hot that day, so I definitely took advantage of that! After this part of the tour, we were just about finished with the hiking portion. We walked to another area where we were able to shed our vests and harnesses. We were provided with ice cold wet towels to cool down. YAYYYY!! We boarded a special truck to venture out onto the savannah. This part is similar to the Kilimanjaro Safari attraction; however, this truck is smaller and pull off the road to stop. There are benches to sit on. Binoculars are provided for each person. The biggest difference, we were able to stop along the way, get up and take as many pictures as we wanted. 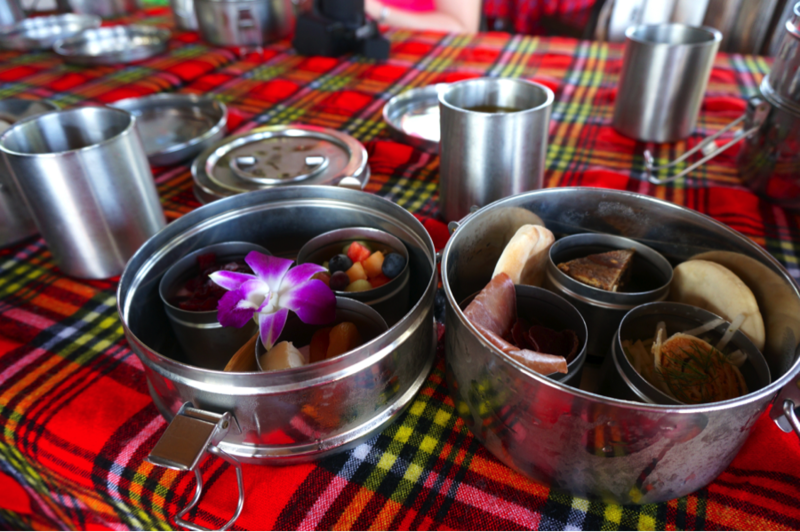 We then headed to a boma to have a light lunch of African inspired foods and a very yummy juice to drink. There are restrooms here as well. 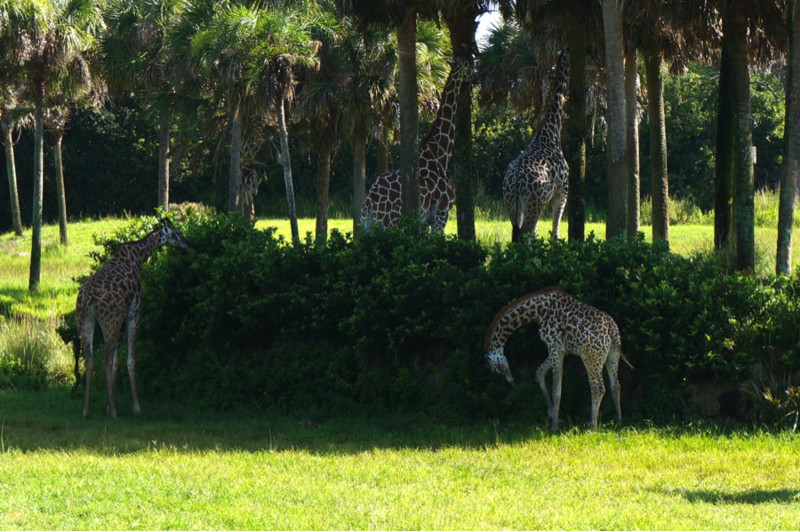 The boma is in the middle of the savannah and has a wonderful view of the giraffes and flamingos. Tour guides also took pictures of us here. The cost of the tour includes a download of all of the pictures taken that day, along with some additional pictures of animals, in case some of them weren’t cooperating. For us, the lions were not anywhere to be seen. But we saw and learned so much about animals and Disney’s conservation efforts. The entire tour, start to finish, is about 3 hours long. It is a wonderful tour and I highly recommend it! Mary Spina is a DIStracted Disney Maven! Mary is a stay-at-home Mom, DVC member and loves all things Disney! She is also known as @DisneyMaryS on Twitter and Instagram. I always see people on this Trek while riding Kilimanjaro Safari. Your article has definitely made me want to give this a try! So, in your opinion it is worth the price? I think it is totally worth the price! It allows you to see the animals from a different perspective. You also learn a lot from the cast members who accompany you and the wildlife specialist that you meet on the Trek! I definitely recommend it! I am sold! 🙂 Thanks!! How exciting!! I know my kids would love this! As long as they are 8 years of age or older and at least 48 inches tall – go for it! Fun article Mary !! It sounds like a ton of fun. Is it for DVC only ? This is not just for Disney Vacation Club members! It is open to anyone! Valid park admission is required.